Illinois Personal Injury Contributory Negligence Law | Hupy and Abraham, S.C. I was partly at fault for my personal injury in Illinois. Can I still recover damages if someone else was also at fault? As long as you were not primarily responsible for the incident that resulted in your injury then you may be able to recover damages even if you were partly to blame. According to the Illinois contributory negligence law (735 ILCS 5/2-116), you may recover damages as long as your percentage of fault was not more than 50% of the proximate cause of your injury. Who Determines Percentage of Fault? You should expect that the percentage of fault will be hotly contested during any settlement discussions or during litigation. Part of the defense lawyer’s strategy may be to claim that you were primarily responsible for the accident or to minimize the percentage of fault attributable to the defendant. If percentage of fault cannot be agreed upon during settlement negotiations, then it will be up to the court to decide during litigation. In a jury trial this critical determination will be decided by the jury, and in a bench trial the decision will be made by the judge. Damages will be determined based on who was at fault for the accident. 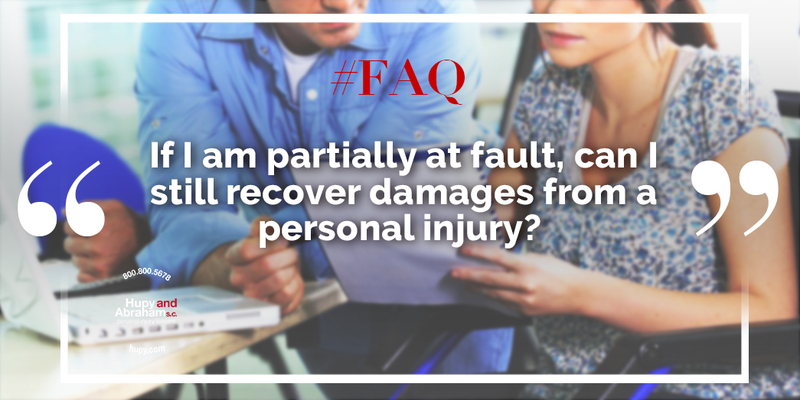 You will not have the legal right to recover damages for your injuries if you were the primary cause of the accident. However, if the defendant was at least 50% responsible for the accident, then you can recover damages. If the defendant caused the entire accident then you may be able to recover for all of your damages. If you also contributed to the accident, but your found to be less than 50% at fault, then you can recover partial damages. Your damage award will be reduced by the percentage of fault attributable to you. For example, if you were 25% responsible for the accident that resulted in your injuries, then your damages will be reduced by 25% according to Illinois law. The defendant should not have to pay for your negligence. Contributory negligence can be complicated and it is critical that the correct percentage of fault be attributed to all parties so that you can get the fair recovery that you deserve. An experienced personal injury lawyer can collect all of the evidence and advocate for your full recovery based on that evidence. To schedule your free consultation with an experienced attorney, please contact us online or call us directly at 800.800.5678. We would be pleased to explain how an Illinois personal injury case works, to answer your individual questions about your own claim, and to help you get the recovery that you deserve.